Story: Amity Island. Great place. Yeah, that shark thing four years ago, but all’s well now…dammit, another shark. Scares: More like fun chills than outright scares. Splat factor: Grody chomped up killer whale, and a few post-death victims providing jump scares. Otherwise it’s just Red In Water. Closing scene “shocker”? : Zip. Huzzah! Remake, Sequel or OG (Original Ghoul)? : Sequel to 1975’s Jaws. Second of the Jaws series. Trick or Treat? 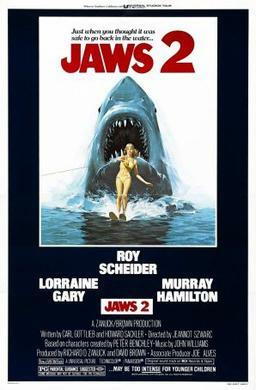 : Jaws 2 starts off fun; LOVE the opening scene with the two scuba divers finding the sunken remains of Quint’s boat the Orca. Gets even better when those deliciously evocative two bass notes start to play. And the shark hunting a water-skier was genius. Fantastic concept, and a great poster image to boot. But – you knew there was a but coming – 2 ain’t the original. Good news though, it’s a whole lot better than the next two in the series. By a lot. I’d say you could make it a double feature with original, but make sure you’re either tired, buzzed, or ready for some camp when you roll this sequel. Why? More shots of the mechanical shark lends a cheesiness to some of the scenes. Wanted MOAR SHARK in the original? No. No you didn’t. Trust. Then there’s the character bonding from the first film that actually made it better than the book. (Seriously, that novel is a downer filled with hateful people.) No bonding to be found here. Yeah, two of the three Amity’s Angels from the original are MIA here, but this screenplay doesn’t bother to try doing anything more than throw bodies in water. That, and having Brody argue. Folks who’ve seen the first film – and if you haven’t what’s wrong with you? – will see the same idiotic, incompetent island politicos, trying to ignore things. How these goobers still have jobs after their last colossal fuckup is beyond me. At least Chief Brody has the good sense to be scared of the water. 2 was made in 1978, before the slasher genre really got going. So even with a cast full of nubile teens, the body count is relatively low. But the shark is crazy strong, and single minded in his pursuit of human protein, and there’s lots of lightweight tension every time Bruce the shark decides exactly who’s going to chowtown. Pay attention, and you’ll catch Keith Gordon, Arnie from Christine, sporting some killer muttonchops as one of the hapless teens. Sweeeet. Expect some hilariously over the top scenes of shark carnage. (Helicopter down!) Don’t expect the bro-moments or tidbits of plot-driven humor that made the first film a classic. But do grab the popcorn and get ready for the delicious cheesiness of a sequel that just wants to have fun. This entry was posted in 31 in 31 and tagged 31 in 31, Shark In Water movies. Bookmark the permalink.